About GA Snakes: Most snakes are not venomous. However, if you are ever unsure about the species of snake that you see, you should leave it alone. 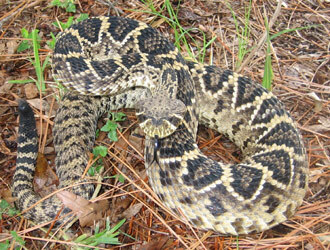 Georgia does host several species of venomous snakes. Most bites occur when people try to catch or handle these reptiles. We have professional snake handling equipment that makes the removal of unwanted snakes both outside and inside the home safe. Snakes are a common nuisance reptile in southeast Georgia. In Atlanta and Fulton County, snakes have become a particularly common problem, as they have invaded many properties in the area. If you need a professional solution for your Atlanta snake problem, give us at A Wildlife Pro a call. You know you sent me a photo of a baby cottonmouth, which is extremely rare, and looks identical to the very common Banded Water Snake in Georgia. If you get an original photo of a snake, I can properly identify it for you. We can also provide Atlanta snake removal services. Well, someone took a pic but I don't know who! My son said the pattern is identical but color was more grayish and was about 3 1/2 ft long. Hypothetically if it in fact was a moccasin what is the possibility that there are more? And should I be worried that I may see more in my yard, that far from the water? Lets put it this way. In my ten years as a wildlife removal expert, I have removed over 1000 snakes from people's property, and never once an actual water moccasin. But over 100 Banded Water snakes, which look almost exactly like the photo you showed me. Most 3.5 foot moccasins have lost their baby pattern, like in the photo you showed me, which only little moccasins have. But hey, maybe you're the exception. I can't speculate about the possibility of other snakes in your yard, sorry. Maybe, maybe not. I am certainly glad to help you if you need me.